Zeta Reticuli (ζ Ret, ζ Reticuli) is an actual ‘REAL’ binary star system in the southern constellation of Reticulum. 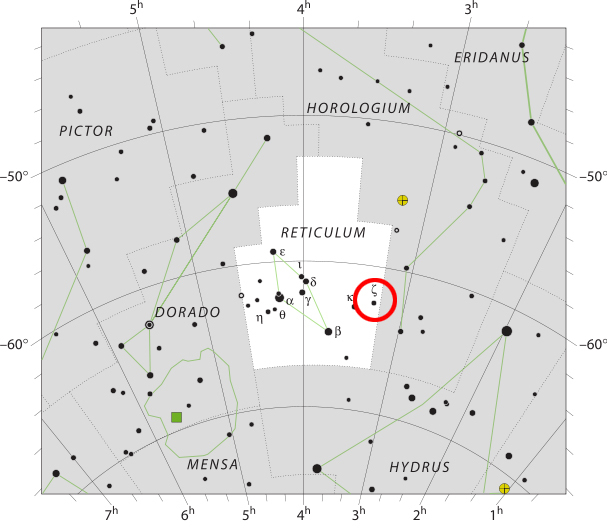 From the southern hemisphere the Zeta Reticuli 1 & 2 can be seen with the naked eye as a double star in very dark skies. Based upon parallax measurements, this system is located at a distance of about 39 light-years (12 parsecs) from the Earth, also quoted in the original Alien movie. A nice little touch I came across today was that the synthetic robots’ names in the series are in alphabetical order, according to film release dates: Ash is in “Alien” (1979), Bishop is in “Aliens” (1986) and Alien 3 (1992), Call is in “Alien: Resurrection” (1997) and now David, played by Michael Fassbender in “Prometheus.”.